This sauce hails from Provence and is closely akin to pesto, the Italian version from the Liguria region just over the French-Italian border. The difference is that the French omit the pine nuts and, usually, the cheese. A version this herbal sauce with garlic has been around since Roman times: Virgil mentioned it in his Eclogues, although the Romans probably used parsley rather than basil. In France, this aromatic sauce is most frequently used in Soupe au pistou, a summer soup with chopped vegetables and dried beans that is not very different from minestrone. But its fabulous pungency can add pizzazz to many dishes. A spoonful drizzled over pasta, fish, chicken, veggies or salads transforms a dish from ordinary to exceptional. 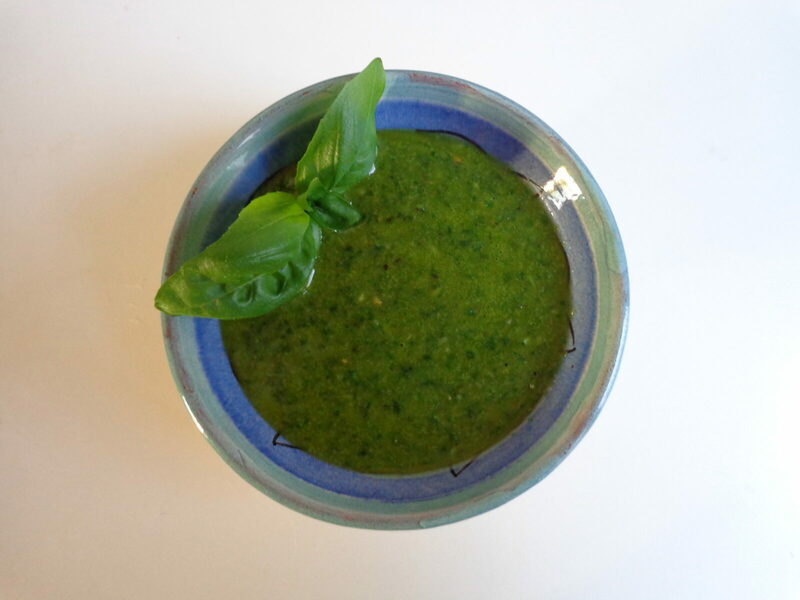 Pistou is traditionally made by pounding the basil and garlic together with a mortar and pestle, but these days it is most easily made in a blender. The recipe is simplicity itself. Preparation takes less than 5 minutes. Happy cooking! 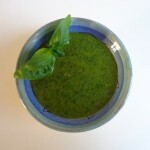 This entry was posted in Et cetera and tagged French basil sauce, pistou, recipe, vegan. Bookmark the permalink.